The Arsenal of Communist Aggression expands FURTHER! 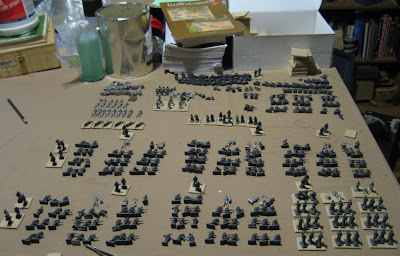 In addition to the stuff I had originally listed I also got rid of a few surplus 15mm WW2 things and some ACW stuff. I would have been happy for a battalions worth of the East Germans the fellow I was trading with promised. I there was enough for an under-strength regiment I would have been tickled pink… What I ended up with was almost enough stuff for a full strength DIVISION!!!? GADS!! So a big, BIG thank you to Mr. Donald R Maddox Jr of Texas! If that weren’t insane enough, he also sent even MORE 25mm Romans for John’s part of the trade!? 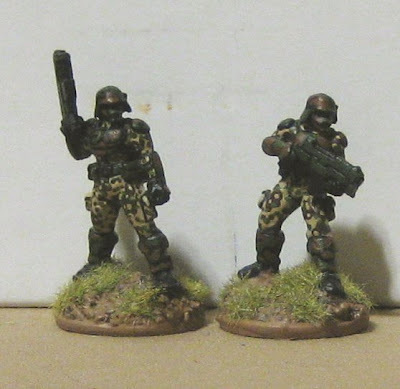 I’ve already painted up three stands of Mortars to equip my Soviet Motor Rifles. 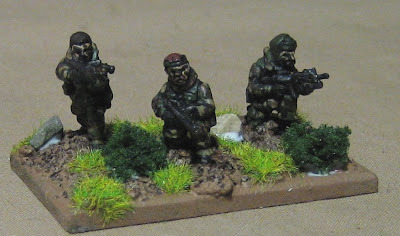 Also this week I finished up two Command (HQ) Stands for my 20mm WW2 Russians. 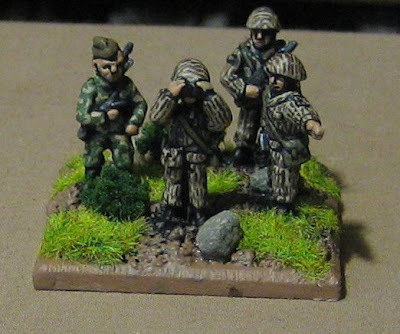 These are old Platoon 20 figures that were produced under license by Rafm. 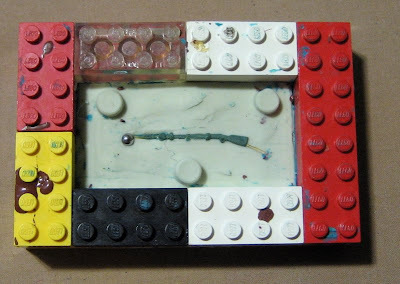 I also retrieved my half poured musket mould from John – as I’ve got some new rubber of my own I can pour the second half with – hopefully get on that this week. 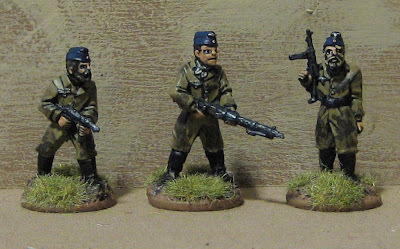 I’ve also did a little bit of work on the new masters I’ve been working on and started a couple new 20mm masters over the last week or so (they are destined to be more Canadians and FRENCH – to help stem the tide of the communist hordes!). I also started painting some of John’s Descent figures. Watch for some pics next week. 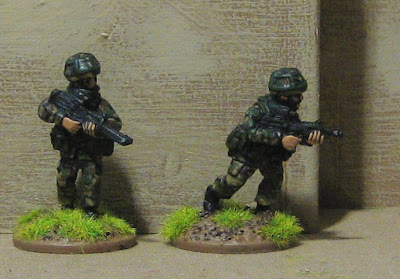 I started some armatures to make a few new 20mm masters – going to do a couple more Canadians and maybe some ‘80’s French or some generic Soviet equiped troops… I also ordered a new tin of RTV so I’ll be back to sculpting for a bit (and CASTING!) 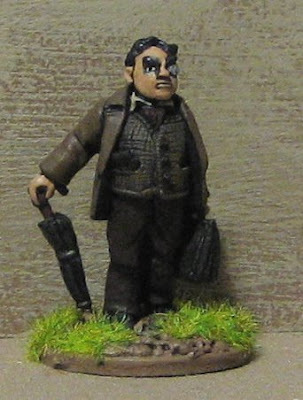 as well as painting some Descent figures for my pal John in Calgary. 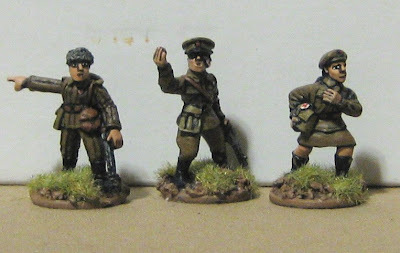 Some old Platoon 20 WW2 Germans produced by Rafm. 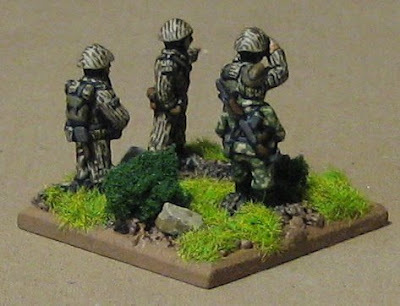 Two infantry units and two pioneer units. 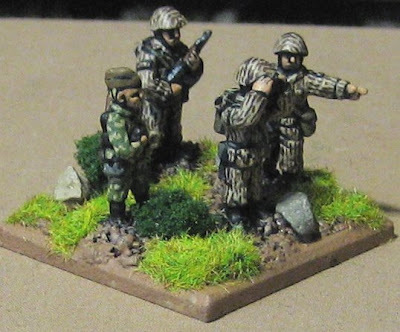 This should finish off the infantry and pioneer stands for my 20mm WW2 Late War SS Panzer-Grenadiers… of course I still have a few mortars and MGs to finish up and a load of AT guns and Tanks, etc! Some i-Kore Void figures. I pcked up a PILE of these from a $1 per pack bargain bin last winter to some day use as generic sci-fi skirmishy types. Just experimenting with some different camouflages at this point. This is the last of the Russian infantry. Now I just have to finish off the KV-2 and the GAZ jeep. Even with this drastic reduction in productivity I still get more done than half the clowns that call themselves miniature gamers in this town! I finished up another pile of Russians last night. I only have three more to go plus the GAZ and crew and the KV-2…. Then I guess I’ll need to get MORE!!! BWA-HA-HA-HA!!! !